I was going to include this in a "scattered meets" for September, but I thought this is unique enough that I should give this meet its own report. Generally when it comes to politically related names, I go for anything presidential/vice presidential related and 9/11 attacks related. 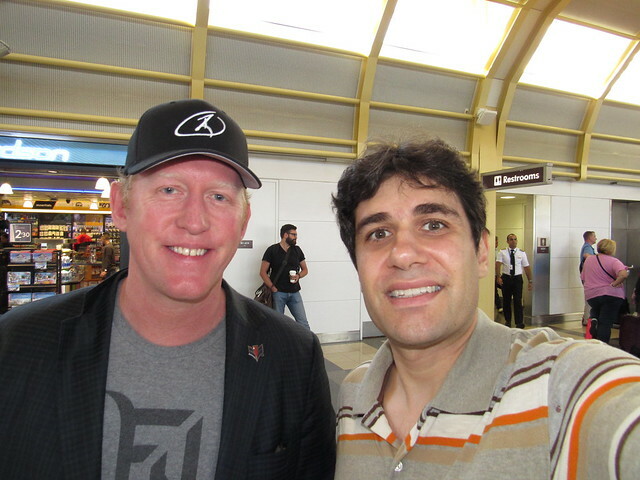 So when I had the chance for Rob O’Neill, the man who shot and killed Osama Bin Laden, I figured that would be a good addition to my collection. Went to the airport and waited. Eventually he arrived wearing hat and shades as his flight boarded. He stopped for us and did combos, removing his shades for photo ops. He wouldn't sign any images of Bin Laden nor would he sign my 12" 1/6 scale Bin Laden action figure. I also tried to get a photo op with him while I held the figure, but he wouldn't do that either. Personally I don't know how wise it is to reveal you shot Bin Laden. Just as combo hunters found his info and were waiting for him, could have been someone wanting revenge against him. Last edited by class316 on September 18th, 2018, 10:46 pm, edited 1 time in total. For some reason, I exploded with laughter at this. Why does Bin Laden have an action figure? I can’t blame the guy for not wanting to sign or take pictures with anything Osama related. Glad you got some happiness out of it. Why does Bin Laden have an action figure? There's an action figure sub culture for accurate 12" 1/6 scare historical figures. This includes everything from most every era. There are figures of everything from Genghis Khan to Barack Obama. And the great thing about these figures is everything about them is free from political correctness and depicted as historically accurate (as they should be, especially for what they cost). Bin Laden, like him or not, is a valid historical figure. Hence how he got this. Long time ago (10+ years) I started to collect them but they got expensive so I stopped. I still own a handful, including the Bin Laden one shown here. Interesting get, but you'll never get the man who gave the order. So you not only own a Bin Laden action figure, you asked the soldier who killed him to sign and/or pose with a Bin Laden action figure??!!!?? Just when I think I've read the most psychopathic thing you've ever posted, you always manage to "top" yourself. The man is far kinder than I would have been - if I was in his shoes, the moment you pulled out the Bin Laden figure, I would have walked away and given you nothing. No but the money it would have fetched would have been very valid. You mean Obama? Technically I did get him autograph wise in the past. Sold them though. And I have an invalid shot. He used to sign 8x10s of Bin Laden. But this time he didn't. Other graphers had photos of Bin Laden. Each 8x10 would go for like $500. Had he refused to sign Bin Laden images in previous encounters I would not have asked. Last edited by class316 on September 18th, 2018, 9:02 pm, edited 1 time in total. There's nothing quite like calling a guy who was nice enough to take a photo op with you an "idiot." Nor suggesting a man who served the cause of freedom to live in hiding and fear at home. Very debtabtle who or what he served. Remember Bin Laden was basically a biproduct of the actions of traitorous American politicians (via US foreign policy). Also at one time Bin Laden was dubbed an anti soviet freedom fighter before he was dubbed a terrorist. But again, not about fear or hiding. You admit you shot Bin Laden you expose yourself to people who want to avenge him. He could have just kept his mouth shut and lived normally. One time at a flight I heard he even asked combo hunters how is it that they find him when Isis can't. Almost Sounds like a defense of bin laden. Definitely gonna stir controversy with that one..